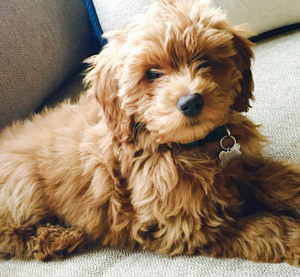 You are here: Home / Characteristic / Mini Goldendoodle vs Mini Labradoodle – Which is Right For You? Often people believe the Labradoodle and the Goldendoodle are the same breed. Some believe a Goldendoodle is another name for a Labradoodle as their coats are often golden in color. A Labradoodle and a Goldendoodle are two different mix breed dogs. 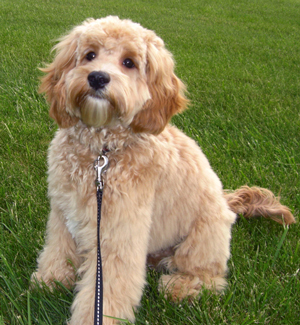 When comparing a Goldendoodle with a Labradoodle the most significant difference is the mix that creates their breed. 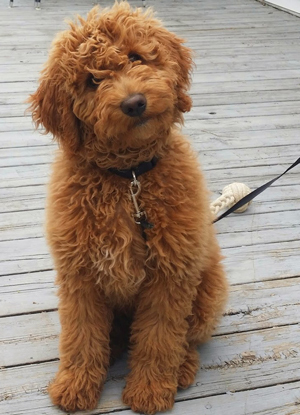 A true Goldendoodle is a mix between a Golden Retriever and a Poodle, whereas a Labradoodle is a mix between a Labrador and a Poodle. Both these breeds share a Poodle mix and the fact they both have retriever traits as a common ground. Although very similar, there are slight differences between these two breeds. This article will help you understand which breed will be the best fit for you and your family. 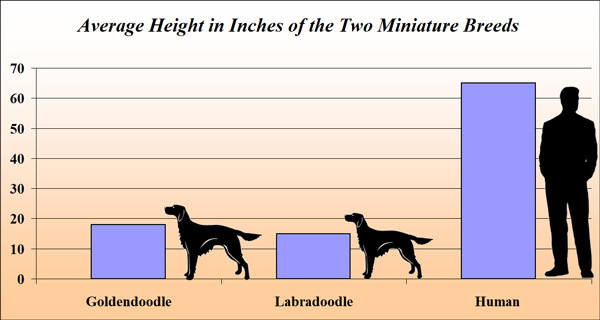 The following table outlines the main similarities and differences between the miniature Labradoodle and the miniature Goldendoodle. Below you can find the average weight, average height, life expectancy and pricing of each of the breeds. Both these breeds are classed as low maintenance. These dogs have hypoallergenic qualities and have a low shedding coat. 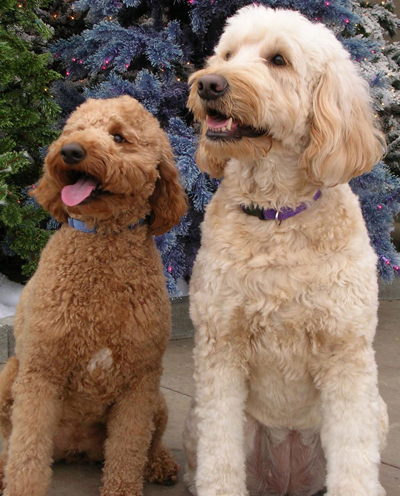 The Goldendoodle’s coat tends to be longer while the Labradoodles are shorter and have less wave to them. Due to the length of the Goldendoodle’s coat, they will need to be groomed more often in comparison to a Labradoodle. It is recommended that a Goldendoodle is groomed by their owners everyday and at a minimum of once a week. The color range of a Labradoodle is more extensive than a Goldendoodle. The Goldendoodles coat tends to be curlier whereas the Labradoodle’s coat tends to be more terrier like; wiry and short. As far as eye color goes, a Goldendoodle can have either brown or amber eyes. These dogs have a medium length coat that are relatively thick and wavy. When choosing a dog that you wish to train to be used in a service such as a seeing eye dog, the Labradoodle is the best choice. If you wish to train your dog to visit young children or the elderly regularly the Goldendoodle is a better choice. In saying this, both of these breeds are easy to train due to their intelligent nature. Before deciding on a dog breed it is important to research their nature to ensure that their expected temperament will fit into your family. Due to the fact both miniature Labradoodles and miniature Goldendoodles are hybrid dogs (meaning a mix of more than one purebred dog) you can only make an educated guess on what their temperament will be like. In the cases of these two dog breeds, their parents all share similar natures allowing us to make an educated guess of the dog’s personality. The miniature poodle makes up one parent in both of these mix breeds. Miniature poodles enjoy being active including walking, running and they also enjoy swimming. Often people believe Poodles are snappy dogs although this is easily preventable through socialization. The Labradoodle’s Labrador parent enjoys retrieving games and being active while the Goldendoodle’s Golden Retriever parent can be classed as tolerant, intelligent and a lover of any sport. Both breeds are well tempered and make great family pets. The difference is the Goldendoodles appear to be more energetic when it comes to games such as fetch. A Labradoodle is more inclined to investigate a person before approaching them, whereas a Goldendoodle is a lover of everyone and won’t hesitate to run and cuddle a stranger. Both these dog breeds are overly friendly and have a kind nature. Out of the two breeds, the Labradoodles tend to be the more protective dogs. Although neither of these dogs would work to guard your home, they will watch and bark if needed. These dogs breeds are equally recommended for a new dog owner. Both breeds are classed as high energy dogs meaning they need regular exercise. Being highly intelligent dogs, little to no exercise triggers behavioural issues. These are not a lap dog and are not suited to people who are not willing to take them on walks. The Goldendoodle is the slightly larger breed out of the two. It is important to understand each mixed breed dog will vary in size depending on how big or small their parents were. The following graph shows the height of each miniature breed in comparison to the average height of a human. Both the Labradoodle and Goldendoodle are priced upwards of $1000 with some puppies priced at $2500 from reputable breeders. This can vary between breeder. The price of these dogs has risen with the high demand in the current market. Both these breeds are often similar in price. On average, mix breed dogs live longer than purebred dogs. A Labradoodle and a Goldendoodle both have a life span of between ten to fourteen years. Both these dogs, like any breeds have the risk of getting a specific health condition. For the Labradoodle, the common health risks are skin irritations, hip dysplasia and allergies. The Goldendoodle is more prone to getting hip dysplasia, cataracts, allergies and epilepsy. It is important to understand that not all of these dogs will be victim to a health condition and most live to a prime age free of any health concerns. I have a golden labradoodle. Golden are the best choice. In fact goldendoodles come in all the colors you list plus chocolate, black, and parti with the background color being any of their colors. Depends on the color of the poodle lineage.